Until then, the science team is keeping Curiosity busy with additional measurements to better interpret the local and regional geology. In today's two-sol plan, Curiosity will begin with a 1 hour and 40 minute science block dedicated to studying the exposed rocky material in front of the rover. The science block kicks off with ChemCam measurements of surface chemistry using the onboard laser and spectrometers. 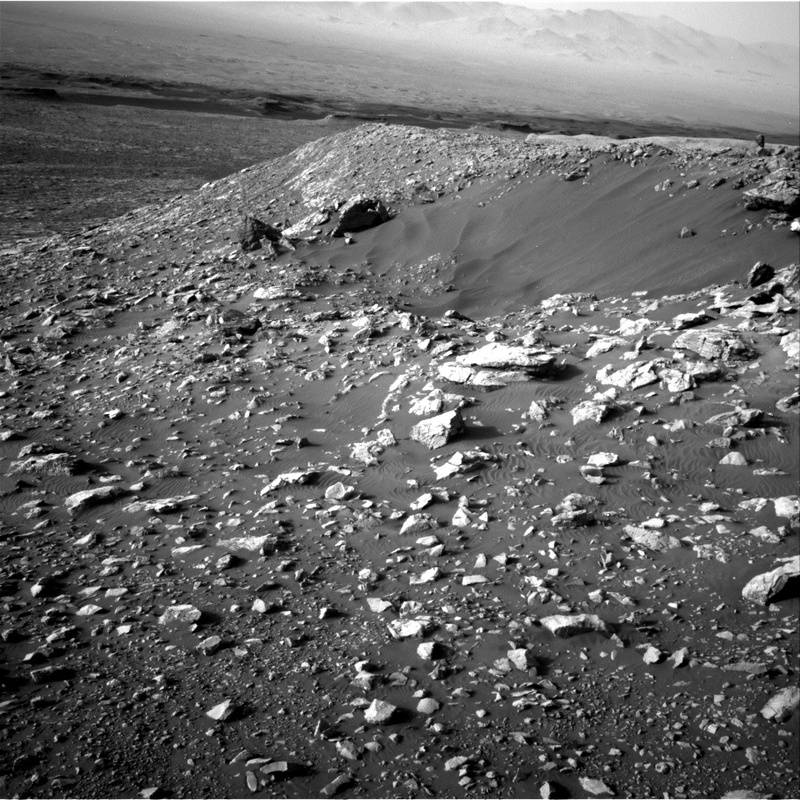 The targets include "Mesabi," a textured rock towards the left-front wheel, then "Wakemup Bay," which appears to be in-place bedrock, and finally "Midway," a long and narrow rock in front of the rover that has potentially been broken apart by the small impact crater (named "Taconite crater"), to the north of Curiosity. ChemCam's high resolution camera will then be used to image a rock on the western rim of Taconite crater (named "Logan") at very high resolution to see if it shows any interesting features associated with the impact cratering process itself. Mastcam will then be used to image the surrounding area, including all of the ChemCam targets that were analyzed. In addition, a multispectral image suite will be obtained of Taconite crater's nearby ejecta field, as a way to determine whether the composition of the ejecta blocks are at all variable, which may indicate that the subsurface geologic units differ in composition from those closer to the surface. Stay tuned! Following this science block, Curiosity has a ~48 meter drive planned to the northwest, which would result in another 10 meters or so of decreased elevation as we near the Blunts Point member. Standard post-drive imaging activities will then occur, obtaining images of the landscape surrounding the rover for both scientific and engineering purposes, as well as a MARDI image of the terrain immediately below the rover's belly. The next sol, Curiosity will use her automated targeting capabilities to retrieve chemistry measurements of a nearby bedrock target. Following a nap and a quick chat with one of the Mars orbiters, Curiosity will then have one additional science block that is dedicated to environmental monitoring, including measuring the atmospheric dust concentration and searching for dust devils. This will then bring us to Friday, when the science team will plan for a weekend of activities and a drive that will have Curiosity once again head downhill. At this location in Gale crater, the team is naming targets after locations in northeastern Minnesota. The names chosen today are perfect to use while we're still on Vera Rubin Ridge, as the Mesabi Range is part of Minnesota's Iron Range, a series of Precambrian (i.e., old!) sedimentary units that are enriched in iron. These areas were heavily mined in the early 1900s, and were an important part of Minnesota's economy at this time. Currently, this area is still being mined for low-grade iron ore known as "taconite" (hence Taconite crater! ), a sedimentary rock with significant amounts of iron and other mineral phases. Kudos to today's science team for the relevant names!